Improve your balance in Pilates mat exercises. These high-density EVA foam rollers have excellent memory characteristics – so they regain their original shape after being compressed, time and time again. 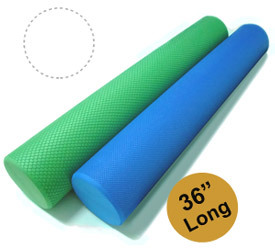 This makes these durable foam rollers are ideal for abdominal and spine stretches in yoga and massage therapy too. The rollers have rounded corners for added comfort. Choose either 12'' or 36'' lengths. I love the EVA foam muscle rollers! awesome and great colors, soft but firm. We use them for our Relief Through Rolling Classes at Absolute Health Chiropractic, Inc.
Maintains its structure even after years of use. This roller was easier than other firm rollers to adjust to. The texture is nice, too. I ordered short half round and fullround long foam rollers, they were firm enough and giving enough to provide good stability support without excruciatingly painful massage. the small pilates core ball was perfect. I use this roller for all of my stability exercises and it is a life saver. I was introduced to this foam roller at the end of a pilates class I took. We lied on our backs and used it to massage our own backs. I knew I needed to own one of these for my home.